Legislation additional to the welfare, health and safety Standard is as follows. (i) The Special Educational Needs and Disability Act (SENDA). (ii) Race, gender and sexual discrimination legislation. (iii) Corporal punishment. The inspection was also carried out under the arrangements of the ISC Associations for the maintenance and improvement of the quality of their membership. ISI is also approved to inspect the Early Years Foundation Stage (EYFS), which was st introduced in September 2008 and applies to all children in England from birth to 31 August following their fifth birthday. This report evaluates the extent to which the setting fulfils the requirements of the Early Years Foundation Stage Statutory Framework published by the Department for Children, Schools and Families (DCSF) and follows the requirements of the Childcare Act 2006 as subsequently amended. The inspection does not examine the financial viability of the school or investigate its accounting procedures. The inspectors check the school‟s health and safety procedures and comment on any significant hazards they encounter: they do not carry out an exhaustive health and safety examination. Their inspection of the premises is from an educational perspective and does not include in-depth examination of the structural condition of the school, its services or other physical features. St Olave‟s Preparatory School was founded in 1932 and is a co-educational day school for boys and girls aged between three and eleven. It is situated in Outer London in the borough of Greenwich, and close to the borders of Bromley and Bexley. Since the previous inspection the school has become a two-form entry school from Reception to Year 6 and the premises have been expanded to include two adjoining plots of land. A second storey is presently being added to the most recent school building, the Parkview building. 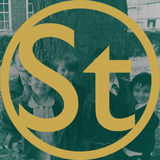 The school is a charitable trust, administered by a board of trustees. The school currently has 220 pupils on roll, 136 boys and 84 girls. Forty-six of these pupils, of whom twenty-seven are boys and nineteen are girls, are in the Early Years Foundation Stage (EYFS), which is on the school site. This comprises a Pre-Prep class for children aged between three and four years of age, and two Reception classes for children aged between four and five years of age. Twenty-nine EYFS children attend school full time and seventeen attend on a part-time basis. Pupils come from a wide catchment area and from a variety of backgrounds. Most live in the Boroughs of Bexley, Greenwich and Bromley. Two pupils have English as an additional language (EAL) and receive support for their acquisition of English. Twenty-seven pupils have been identified as having learning difficulties or disabilities (LDD). No pupil has a statement of special educational needs (SEN). The ability profile of the school is above the national average overall, with a wide range of abilities within the school. The school aims to focus on the individual child, encouraging pupils to grow in confidence and self-esteem, to benefit from a broad and rich curriculum and to reach his or her potential, making the most of their talents. The school successfully meets its aim to focus on the individual child, ensuring they achieve their academic and personal potential and recognising their talents and interests. Pupils of all abilities are most successful in their learning and personal development throughout the school, including in the EYFS. The quality of the pupils‟ achievements and the quality of their learning, attitudes and skills are excellent. Pupils‟ attainment is good, and they make at least good progress over time in relation to their ability profile, which is above the national average. This enables them to achieve considerable success in entry to senior schools. They have an excellent grasp of basic skills and demonstrate considerable imagination, creativity and attention to detail. Their achievements are promoted by a broad and vibrant curriculum and effective teaching. The strong emphasis on visits to places of interest, and a wide range of extra-curricular activities complement the curriculum very well. The provision for pupils with LDD or EAL and for gifted and talented pupils is fully integrated into the curriculum. The pupils‟ personal development is excellent and supported by the outstanding pastoral care, welfare arrangements and health and safety. Pupils are extremely tolerant and respectful of each other‟s differences and grow into confident, thoughtful and supportive individuals. Their care for each other is embedded in all aspects of school life. Staff provide excellent support and guidance, making pupils feel valued as individuals; pupils say there is always someone to whom they can talk. Standards of behaviour are high and pupils say that unpleasantness is extremely rare. Excellent attention is given to the pupils‟ welfare. In response to questionnaires, pupils were extremely positive and said how much they enjoy being at the school. The trustees provide excellent oversight and support in all areas, and are fully committed to the school‟s aims and ethos. They have a clear oversight of the school, informed by the reports from the headteacher and through regular meetings of the board. They have responded well to the recommendation from the last report to appoint co-ordinators for each curriculum area, and to provide appropriate training and support. Excellent leadership and strong management of both the curriculum and pastoral care supports the high quality education pupils receive. Recruitment procedures are robust and all the required checks on staff, regular assistants and visitors are applied fully and correctly. Links with parents are strong. The parents‟ replies to the pre-inspection questionnaire show that most are very happy with the school, especially its breadth of curriculum, the progress their children make, and the pastoral care they receive. A small number of parents indicated that they consider support for learning difficulties to be insufficient, would like more information on their children‟s progress and wish to be more actively involved in the life and work of the school. No evidence to support these views was found during the inspection. At the time of the initial visit, the school met all the requirements of the Independent School Standards Regulations 2003, as subsequently amended. In order to comply with the welfare requirements of the Early Years Foundation Stage, the school was required to: keep written records of all medicines administered to children and inform parents. Since the Early Years Foundation Stage provision is inspected under a different system of regulation, within a two-day limit, the report cannot mention any regulatory deficiencies which are remedied by the end of the standard inspection. The school is advised to make the following improvements. 1. Extend monitoring by subject co-ordinators and include mutual observation across subjects and age groups to share best practice in teaching and learning. Reshape the school‟s development plan to bring more sharply into focus its aims and priorities, and to assess success in achieving them. Develop free flow to the outdoor area for children in the EYFS. Develop stronger links with outside agencies in the EYFS. The quality of the pupils‟ achievements and the quality of their learning, attitudes and skills are excellent. Pupils‟ attainment is good, and they make at least good progress over time in relation to their ability profile, which is above the national average. At all stages of the school, pupils show good levels of knowledge and understanding, and well developed skills. The vast majority of pupils each year gain a place at the school of their choice for secondary education, several with scholarships or awards. The school meets fully its aims to focus on the individual child, ensuring they achieve their academic and personal potential and recognising their talents and interests. Pupils are expressive and confident communicators who argue with clarity and eloquence. The pupils achieve high levels of creativity. Excellent displays around the school cover a wide range of their work and exhibit a high standard and much individuality. Pupils of all ages display well developed literacy skills. The presentation of their work is excellent, and mature speaking and listening skills were demonstrated in pupil interviews. Pupils have well-developed information and communication technology (ICT) skills, and examples of independent learning are evident in many subject areas. Older pupils demonstrated excellent numeracy and problem solving skills in mathematics where they planned, designed and compiled budgets for the building of a theme park. Pupils collaborate extremely well with each other, as evident in their writing of their own interpretation of a drama production of „Rebecca‟s World‟. Pupils do well in mathematics and language challenges, instrumental music and ballet examinations. Games and physical education (PE) skills are well developed in a variety of sports, and teams are successful in tag rugby, netball and basketball. Pupils have achieved recent successes in speech and drama examinations and English writing and speaking competitions. Pupils have excellent attitudes to learning and this contributes to their successful achievement. Overall they benefit from a stimulating environment where learning is consistently nurtured. They are encouraged to achieve high standards within their individual capabilities and they know that their efforts are appreciated. The curriculum is well planned to meet the pupils‟ individual needs and effective support is given to pupils for whom work is more difficult, or who have LDD or EAL. Gifted and talented pupils receive additional high-quality support in small groups to develop their thinking and analytical skills further. Since the previous inspection the school has introduced subject development plans which effectively support crosscurricular planning at all ages. The curriculum includes excellent arrangements for transition between different stages of the pupils‟ education. Information on pupils joining Year 1 from the EYFS is transferred effectively, and the needs of any who have not yet achieved all the Early Learning goals are addressed well. Pupils in Year 2 make a smooth transition to Year 3 and pupils in Year 6 are well prepared to move to their choice of senior school with confidence. The school buzzes with activity and endeavour in a wide variety of sporting, musical, dramatic and other activities. These activities range from the St Olave‟s Singers, a non-selective choir for pupils who just love to sing, to kayaking and „Brainbusters‟, a club designed to develop reasoning and critical thinking skills. Many pupils learn musical instruments and attend ballet and speech and drama lessons. The ethos of the school encourages all pupils to take part in as many activities as possible with a clear emphasis on the element of fun. There is, therefore, a wide range of opportunities for pupils to represent the school in sport, as well as to perform in music or drama. Work in class is enriched by an excellent programme of trips, visits and presentations by visitors, where the strong practical focus helps to bring learning to life. A first-rate Year 6 leavers‟ programme includes a visit to the Houses of Parliament where pupils are met by their local MP and attend workshops to help them understand the process of government. There are also residential trips organised for older pupils, which make a significant contribution to their personal development through fostering leadership skills, team spirit and awareness and respect for each other‟s capabilities. Theme days such as the Year 4 Roman Day are regularly scheduled. All these activities, which enhance the pupils‟ educational experience immensely, are spoken of with great enthusiasm. Pupils commented that “there are always exciting things to do”. The pupils‟ education is further enhanced through a variety of links with the local community. They visit the local library and places of worship, and use local sports facilities, which provide excellent, year-round physical education provision. The pupils‟ support for many charitable events is enthusiastic and most successful, and a number of charities in both the local and wider communities are covered. The pupils‟ personal development is supported by an effective programme of personal, social and health education (PSHE), where they are encouraged to discuss topics of concern to them. The pupils‟ achievements are strongly promoted by good teaching that is wellinformed, interesting and helpful. Some teaching is excellent. The positive relationships between staff and pupils promote successful learning throughout the school in line with its aims. Pupils enjoy a highly productive rapport with their teachers, and the majority of lessons are characterised by an air of mutual respect. As a result of positive encouragement, pupils remain focused, and exemplary behaviour is the norm. Careful planning in schemes of work and effective classroom practice ensure that pupils of all ages and abilities make good progress in line with their capabilities. A wide variety of teaching methods are employed using high quality and exciting resources. Teaching assistants support the pupils‟ learning well, and interactive whiteboards are used imaginatively. In a few lessons, pupils develop their independent learning skills more slowly when time is not managed well and activities are over-directed by teachers. In the most successful lessons, teaching is inspiring and imaginative, demonstrating an understanding of individual learning needs and styles, and encouraging pupils to think for themselves, enabling them to develop their knowledge, understanding and skills well. These lessons are characterised by effective time management, with clear learning objectives and criteria for success identified and shared with the pupils at the start of each lesson. The plenary sessions in these lessons provide pupils with information on how successful they have been, and what they now need to do to move their learning forward. The quality of marking is generally high. It is regular and thorough, and is understood by the pupils who consider it helpful and encouraging. Assessment procedures are good. Teachers use a variety of informal methods to check the pupils‟ knowledge and understanding within the classroom, including written and oral tests, quizzes and end of topic mini-assessments. The school uses nationally standardised measures of progress in English, mathematics, spelling, verbal and non-verbal reasoning skills, to identify the pupils‟ progress. The data from these assessments is carefully analysed and the results shared with teachers who integrate it into planning documentation successfully. The quality of the pupils‟ personal development is excellent and is effectively supported by a nurturing school community in which all staff members show excellent commitment to pastoral care. The attitudes and outlook of all pupils reflect the school‟s aim to prepare them to progress to the next stage of their education with self-confidence, knowledge and ideals, so that they can take advantage of every opportunity that comes their way. The pupils‟ spiritual development is excellent and is enhanced by regular assemblies where they sing well and enter into the spirit of the occasion. Pupils have a strong sense of identity and self-worth which is encouraged through the PSHE programme, and through opportunities to have roles of responsibility. They demonstrate an appreciation of what is beautiful, for example when looking at art work and sculpture. They are sensitive to the wonders of nature, displaying “awe and wonder” at the eating habits of the Venus flytrap plant. The pupils have sympathy for sufferers of bullying and hardship, and display both joy and sorrow when reading or listening to happy and sad stories. Pupils of all ages respond reflectively to music in assemblies and in lessons. The pupils‟ strong moral awareness is at the heart of the life of the school and pupils of all ages clearly understand that their actions have consequences and they can distinguish between right and wrong. Pupils think of others as well as of themselves and are enthusiastic when raising money for their chosen charities. They are very clear about the difference their support makes to the lives of those less fortunate than themselves. The pupils‟ social development is outstanding. They interact with each other with tolerance and mutual respect. Effective leadership skills are shown in response to opportunities for responsibility which Year 6 pupils have in houses, sports teams and for younger pupils. Pupils have a well developed knowledge and understanding of public institutions and democracy, effectively promoted by events such as a Year 6 visit to the Houses of Parliament and the school council. The whole school recently undertook an anti-bullying workshop, which had a positive impact on raising the pupils‟ awareness and understanding. Pupils are extremely aware of their responsibilities to the environment, evident in the recycling work undertaken by the Eco Committee, and the “Walk to school on Wednesdays” (WOW) initiative. Pupils have a strong appreciation of, and respect for, their own and other cultures, and they have a tolerant attitude towards those from different cultural backgrounds, both among their fellow pupils and in the wider community. They have welldeveloped knowledge of a number of major faiths and are able to talk about both the differences between them and those features they have in common. A prolific and interesting programme of educational visits enrich pupils‟ knowledge and appreciation of their own traditions and cultures. Involvement in concerts, learning about famous artists, and taking part in and watching drama productions add depth to their cultural experiences. The quality of the arrangements for welfare, health and safety is excellent. The staff provide outstanding support and guidance for all pupils, fostering their personal development and academic achievements extremely well in line with the school‟s aims. Staff and pupils enjoy relaxed but mutually respectful relationships which underpin the school‟s family atmosphere. Pupils say they are confident there is always someone to whom they can turn and that they feel happy and safe in school. Form teachers support their pupils and staff recognise that they have corporate responsibility for all pupils in their care. Weekly staff meetings identify any pupils giving cause for concern and the school counsellor provides effective additional support for pupils with difficulties or worries. The pupils‟ excellent personal development is complemented by the school‟s high quality „wraparound‟ care facility, “Playzone”. The school has an appropriate policy and procedures for safeguarding pupils, and all staff have received the necessary training. Health and safety arrangements are properly overseen by the headteacher and bursar, and risk assessments are detailed and thorough. The school has taken appropriate action to guard against the risk of fire. Fire drills are held regularly and all alarms are tested appropriately. The school provides effectively for pupils who are ill and has drawn up an appropriate plan to improve access for pupils with disabilities. It keeps all necessary records of admissions and attendance. Healthy eating is encouraged by the provision of nutritious lunches. These are almost universally popular with the pupils, who eat well and understand the need for a balanced diet. They are also aware that they need to exercise in order to maintain a healthy lifestyle. The wide range of sporting activities, including cycling club and the WOW initiative, help to promote healthy lifestyles. The quality of governance is excellent. All trustees are highly committed to the good of the pupils, the school and its continuing development. The board of trustees strongly oversees the work of the school and helps to secure the school‟s aims, which support pupils‟ personal and academic development. Trustees are carefully appointed from relevant professions and meticulous arrangements are made for their selection, induction and training. Through an effective structure of committees covering all aspects of the school‟s provision, they provide excellent oversight of the school and discharge their duties most capably. Through frequent reports and visits to the school where they meet with pupils, staff and parents, and close liaison between the chair and the headteacher, the board has a clear insight into the working of the school and provides outstanding support combined with high expectations for continued improvement. Financial oversight and arrangements are careful and thorough and considerable investment is made in staff and resources. The purchase of additional land, which has enabled the formulation of a long-term building plan to develop and improve the current site, represents the culmination of many years of meticulous preparation. The trustees are fully aware of, and most effective in discharging, their responsibilities for child protection, welfare, health and safety throughout the school. This is achieved through the appointment of members with highly relevant experience, and the use of expert advice as necessary. Leadership within the school is excellent. The headteacher and the Senior Management Team (SMT) provide clear and decisive direction in all aspects of school life. As a result the school successfully fulfils its aims, achieving high standards in all areas of activity, and in the pupils‟ personal development, and maintaining through excellent pastoral care an ethos where all are valued equally in a caring community. Management is strong, and the headteacher delegates many aspects to the SMT. Since the previous inspection the school‟s development plan had been revised to represent the vision of the whole school community. It is extremely detailed and carefully linked to the school‟s aims, but lacks focus and criteria to define and acknowledge success. Teaching and learning have been strengthened since the previous inspection, by the appointment of co-ordinators for all subjects. These have a clear oversight of their subjects and manage them well. They offer support and guidance to colleagues and provide in-service training when necessary, but do not presently observe teaching. Staff appreciate the support they receive through appraisal and opportunities for professional development. They support each other through sharing of resources and ideas and by offering help with sporting activities, concerts, plays and general school events. On a day-to day basis the school runs very smoothly, thanks to capable managers at all levels who pay careful attention to pupils‟ needs, and thanks to the efficiency and welcoming presence of the dedicated administrative staff. The school‟s sense of community is further enhanced by the effective work of the caretaking, catering teams and other non-teaching staff who are dedicated to the pupils‟ well-being. The strong links with parents, carers and guardians mentioned at the time of the previous inspection have been maintained and enhanced. The school takes considerable care to communicate effectively with parents and involve them in the life of the school. Responses to the pre-inspection questionnaire indicate that the majority of parents are extremely positive about, and supportive of, the school. They commented most favourably on the teaching and the nurturing care and support that their children receive, and on the high standards they are enabled to achieve. Parents have ample opportunity to be involved in the life of the school. They receive invitations to a wide range of events such as welcome meetings, class assemblies, sports activities, open mornings and school plays and concerts. Charity events organised by the school are well supported by parents and there is a thriving fundraising committee. Parents of pupils and prospective pupils are provided with extensive and relevant information about the school. At the start of each academic year parents are invited into school to hear about the curriculum for the year; this is followed by two parents‟ evenings to discuss their children‟s progress. Pupils with LDD are closely monitored and their progress is reviewed regularly with parents. Two written reports are sent out each year. These provide parents with good information on their children‟s effort, attainment and progress together with suggestions for improvements including ways that they can help. End of year reports set out curriculum coverage and areas of development for individual pupils. The school has a clear and appropriate complaints procedure. Parental concerns are dealt with promptly and treated with care and consideration. Staff meet pupils and parents at the school gate every morning. This ensures the swift delivery of any messages from parents to the relevant teacher. Teachers are visible on site at the end of every day so that parents can approach them to raise concerns or queries. As a result the vast majority of concerns can be dealt with swiftly and informally. The school maintains appropriate written records of concern raised and action taken. A small number of parents indicated that they consider support for learning difficulties to be insufficient, would like more information on their children‟s progress and wish to be more actively involved in the life and work of the school. No evidence to support these views was found during the inspection. What the school should do to improve is given at the beginning of the report in section 2. The school meets the needs of children in the EYFS well, and is successful in its aim to provide a positive and caring environment where children can enjoy learning and achieve well. It has happy, confident children and the strong support of parents. The setting is effective in recognising the uniqueness of each child and planning for individual needs. All children make good progress in their learning and demonstrate outstanding personal development. Every care is taken to safeguard their welfare and secure the safety of all children. The setting has a good understanding of the strengths and weaknesses of its provision and takes steps to improve. The quality of leadership and management is good. Staff hold appropriate qualifications and ratios are very good, ensuring that children are safeguarded and well supported across the curriculum. Suitable risk assessments are carried out regularly in all areas, including external visits. Regular EYFS staff meetings are an effective forum for identifying areas for development. The combined management of the school has an ambitious vision for the EYFS. Policies and procedures are inclusive and children are equally valued. Children‟s needs are further met through good quality resources which are properly organised and deployed. Welfare policies and procedures are nearly all effectively implemented. At the time of the inspection the setting did not inform parents of when medicines had been administered. The school took immediate action to rectify this omission. In their responses to the preinspection questionnaire, parents expressed appreciation of their children‟s good progress and of the nurturing, care and support their children receive. Links with external agencies, including the local authority, to successfully promote children's health, learning and well-being are limited. and, as this area is shared by all pupils, EYFS children do not have “free-flow” use. Children are well supported by their key person who promotes their welfare at all times, encouraging them towards a healthy lifestyle and guiding them towards selfsufficiency. Outcomes for children are outstanding. Children learn and develop well in relation to their starting points, particularly in literacy, numeracy and personal and social education. Most make at least good, if not better, progress and achieve the Early Learning Goals by the end of Reception. Relationships are very strong, and children display high levels of confidence, independence, curiosity and concentration. Reception children demonstrated excellent literacy skills, and outstanding independence and confidence when performing the story of “The Wide Mouthed Frog” in front of their parents and the whole school community. Children show good physical co-ordination and excellent spatial awareness, and play happily together showing admirable co-operation. They have excellent self-help skills, for example knowing why they must wash their hands and how to stay safe. They make healthy choices about what they eat and drink. Children are extremely well behaved and respond well to praise and encouragement. There is an atmosphere of purposeful endeavour where children are happy, deriving much pleasure from their learning. What the Early Years Foundation Stage should do to improve is given at the beginning of the report in section 2. INSPECTION EVIDENCE The inspectors observed lessons, conducted formal interviews with pupils and examined samples of pupils‟ work. They held discussions with senior members of staff and with the chair of board of trustees, observed a sample of the extra-curricular activities that occurred during the inspection period, and attended registration sessions and assemblies. Inspectors visited the facilities for sick or injured pupils. 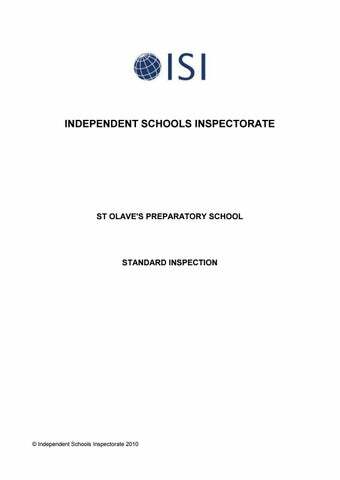 The responses of parents and pupils to pre-inspection questionnaires were analysed, and the inspectors examined regulatory documentation made available by the school.